I have not been to visit my local Joanns for probably 3+ months. I think it was so long because I did not have any coupons. Then, it became habit not going. Yesterday, I stopped in quickly to see if they had the magazines with the new coupons available. I can't believe that I'm a month late in picking up the magazines. 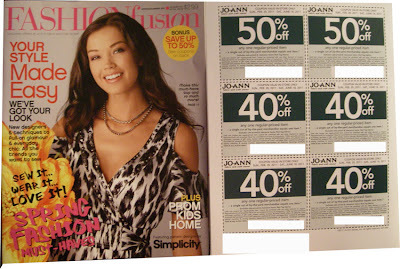 The coupons on the back of the Fashionfusion magazine are good until 6/18/11. Great, I have a couple months. I picked up a couple at $2.99 each. Every time they come out I swear they change the "fine print". This set of coupons specifically say that they can not be used on AccuQuilt Go items, bummer. Can't be used on the slice cartridges as well, another bummer. Oh well, I'm sure there are other things I can find to buy with them. 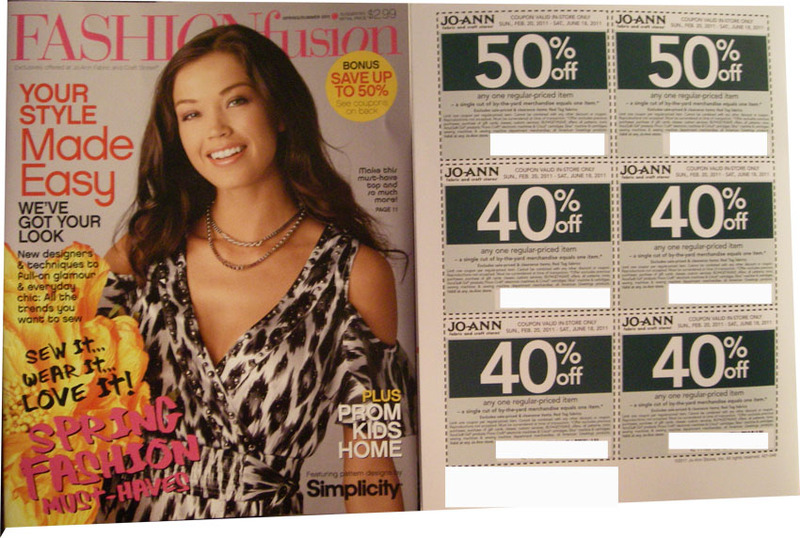 What I love about these coupons is that I use them at Michael's and other craft stores as well. So, I keep a bunch with me at all times. Other times, I like to share them with strangers in line if they don't have coupons.